U.S. ship maker Huntington Ingalls Industries (HII) launched the latest 7,800-ton Virginia-class nuclear-powered attack submarine (SSN), the future USS Delaware (SSN-791), into the water for the first time at the company’s Newport News shipyard on December 17. The entire launching process took three days and involved moving the future USS Delaware out of a construction facility and into a floating dry dock using a transfer car system. The floating dry dock was submerged, and the sub was launched into the water. 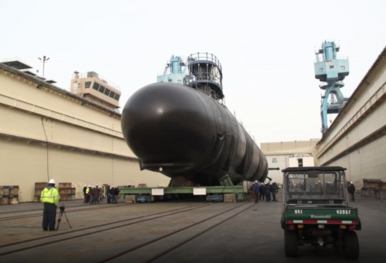 Once afloat, the submarine was then moved to the shipyard’s submarine pier for final outfitting, testing, and crew certification, according to a HII statement. The future USS Delaware is the 18th Virginia-class SSN and the ninth to be delivered by Newport News. Construction of the new sub began in September 2013. The boat was christened on October 20. The boat is the final Virginia-class Block III submarine to be launched. The U.S. Navy’s Block III fleet will consist of eight submarines. The U.S. Navy awarded a $17.6 billion contract for 10 Block IV Virginia-class boats in 2014. While the first 10 Block I and Block II Virginia-class submarines feature 12 individual 21-inch diameter vertical launch tubes able to fire Tomahawk Land Attack Missiles (TLAMS), the Block III boats are built with two-larger 87-inch diameter tubes able to house six TLAMS each (…) The new 87-inch tubes have been designed to accommodate future missile systems in addition to the Tomahawk. In addition, Virginia-class Block III boats are equipped with four torpedo tubes for MK48 torpedoes. Furthermore, next to a redesigned bow, Block III Virginia-class boats also contain a water-backed Large Aperture Bow (…) sonar array that replaces the air-backed sonar sphere found in the first 10 [Virginia-class subs.] This, in combination with the its so-called fly-by-wire capability, enables the boat to perform important intelligence and surveillance missions. Virginia-class boats can carry up to 24 torpedoes and Tomahawk cruise missiles. They can be deployed for a wide range of operations including anti-submarine warfare, anti-surface ship warfare, strike warfare, special operations forces support, intelligence, surveillance and reconnaissance, irregular warfare, and mine warfare missions.